VENTURA — Ventura Harbor Marina & Yacht Yard (VHM&YY) is pleased to announce its appointment as the first West Coast distributor for Allied Boat Works of Peru, Maine (Allied). The first three Allied boats, including a 17 foot Sportsman, 19 foot Classic and 20 foot Sportsman, have arrived and are now available for viewing, sea trials and purchase. Allied boats are renowned for their safety, toughness, dependability, efficiency and affordability. Simple Elegance above the waterline, Allied boats are modified models of the 200 year old dory design with long, elegant sweeping sheer lines and sharp, high prows that easily cut through California chop and heavy seas, wide beams and ample flair for safety and stability. Each Allied is hand laid, using only high quality composite materials, self bailing cockpits and full, high density closed cell foam flotation. The running surfaces provide excellent tracking, maneuverability and overall performance with mid-range (50 to 90 hp) horsepower requirements. 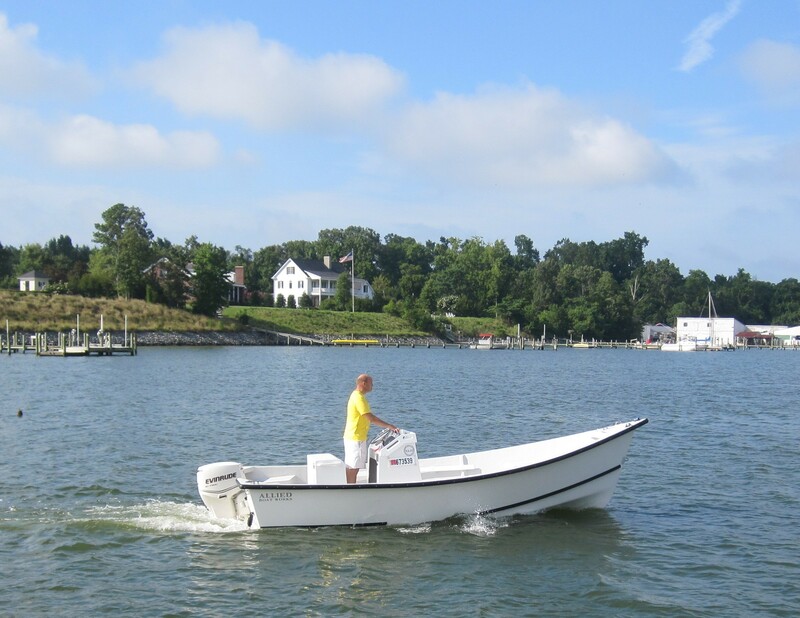 Allied manufactures recreational custom built boats range from 17 to 20 feet in length. Each boat has full foam flotation under the sole, a self-bailing cockpit with oversized scuppers and all marine grade stainless steel hardware and fastenings. Their classic lobster boat style is very popular on the east coast due in part from their superb efficiency, wide beam, and spacious layout for boats of this size. All these factors provide an incredibly stable fishing platform. With their flat running surface and shallow draft you can explore new areas of “skinny” water. The boats signature high prow, bottom and hull design keeps them surprisingly dry. Most of the boats have a center console and leaning post that accommodates two while underway but since each boat is custom made a variety of options are available. The company is excited to be the first West Coast dealers for the Allied boat line and are delighted with the traffic and interest these boats continue to generate since their arrival just a few weeks ago. Sea trials have started and quick turns on the current inventory are anticipated. Interested parties may call Mark or Sam, for additional information and to schedule sea trials, at: (805) 642-6755. Located at the mouth of Ventura Harbor, Ventura Harbor Marina & Yacht Yard is a full service marina with fuel dock specializing in fiberglass and wooden boat overhaul and repair, engine repair and replacement, rigging, bottom painting, exterior and interior detailing. The yard has a Marine Travelift that has a 23 ton capacity. The negative fork lift has the ability to lift 20,000 pounds. The complete line of boats can be viewed at alliedboatworks.com or you can stop by and see them at the Newport Beach Lido Boat Show September 18 to 21.